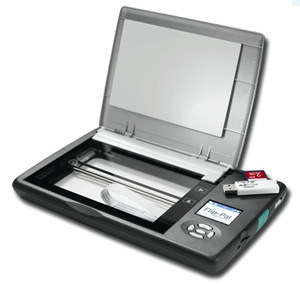 The Flip-Pal™ mobile scanner comes with everything you need to scan, right out of the box. The patented flip-and-scan technology of the Flip-Pal™ mobile scanner allows you to scan photos and documents safely while still in the album, frame, book or ledger. Unlike alternative solutions that do not have the combination of mobility, accuracy, versatility, and keeping the original safe, the Flip-Pal™ mobile scanner is compact, simple to operate, has high resolution, quick scan time, battery power, cordless; no computer required, and onboard memory. StoryScans talking images are easy to create. Simply Select the scan, Record the voice, and Save to create the StoryScans file.